I only recently added the FT-5 cooling duct (the one found on Google drive) and a 40mm 10k server fan. My 0.4mm hotend was not insulated, so within a few seconds I got the thermal runaway error. So I bought new throats, hot ends and nozzles, which I insulated to help cope with the thermal runaway. I decided I wanted to try printing with a super-fine nozzle. In my head, it made sense that a smaller nozzle could/would/should produce a higher quality print. Of course, at the cost of doubling the time it takes to print something, which I was fine with doing. I am continuing to use the typical 1.75 filament, and the stock MK9 extruder. I secured my new nozzle, but when I tried to test extrude I could hear a sort of 'tick' noise coming from the extruder. If I applied pressure to the filament, it streamed out of the nozzle like normal; albeit a smaller diameter. I decided to run a small print. However, the extruder motor continued to 'tick' and only small bits of plastic extruded, nowhere near a straight line! I increased the temperature of the hotend to 225, thinking the plastic needed to be melted better to squeeze out the nozzle. This barely made a difference. Sure, more plastic, but it still was only in small dots spread apart. I tried increasing the filament feed rate to various settings in Repetier host (up to 150%) but the results were still just spots of plastic. A co-worker suggested that I may need to tighten up the tension on my extruder. Something about an adjustable screw. He explained that it would force the filament into the chamber better, instead of just slipping. I looked over my extruder but I could not locate the tension adjuster at all. The only thing I see is a simple spring. 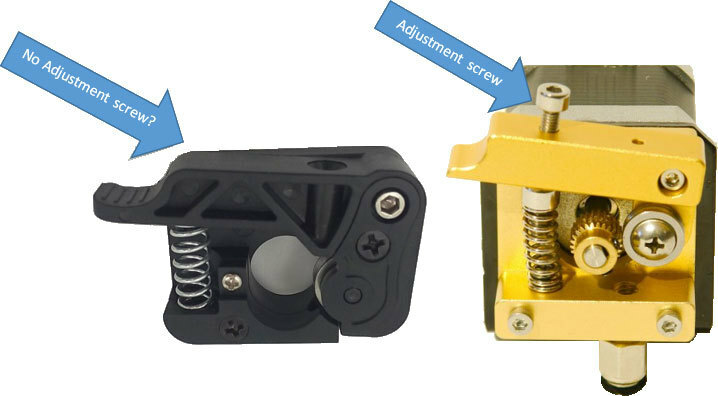 So my question: Has anyone been successful in extruding out of a 0.2mm nozzle using the stock MK9? I did see an article by Walter called Print speed, filament, extruder, nozzle : how fast? which was helpful, but never dipped below the 0.4mm nozzle. I got so fed up with this issue when switching filaments and/or nozzles that whenever I change ANYTHING I first print a temperature calibration tower and then a speed calibration tower before doing any other print using the new configuration. Both are quick to print as single layer vases (2 for smaller nozzles), with no top, bottom or fill. It saves headaches, and makes any problems more visible and much easier to solve. Once you see the sweet spots on the calibration towers, the bad spots provide examples of what "bad" looks like for the current printer configuration and filament. I also do this after a print unexpectedly goes bad, which happened to me two nights ago. A design I had successfully printed many times before was suddenly printing with excessive threads, was pulling up from the bed, and was losing detail. This was on my small delta, which has neither a heated bed nor an enclosure. The recent cooler weather had dropped the room temperature by 15F at night, affecting all my overnight prints. I hadn't realized the impact until I after looked at the calibration towers. I first print a temperature calibration tower and then a speed calibration tower before doing any other print using the new configuration. Both are quick to print as single layer vases (2 for smaller nozzles), with no top, bottom or fill. Do you have a personal preference (links) for the speed and temperature calibration towers? The calibration towers I see on Thingiverse are widely diverse. What do you suggest? I use files I downloaded about a year ago. I didn't check to see if these links are precisely what I use, but they should be close. I found them by searching Google for "customizable tower thingiverse". Be sure to look at those results yourself, as you may prefer other towers. Do NOT use the Thingiverse Customizer! It's way too slow and crashes way too often. But take a look at it to see what parameters exist. Download the Project Files, install OpenSCAD, modify the .scad files, then generate a suitable STL file. It may take a few tries to get what you want (with the best zone near the middle of each tower), but be patient and the results will be well worth it. I store each temperature tower with the filament spool, and add the filament brand/polymer/color to the tower text. Be sure to get all the files (but NOT the .stl files), which may include a Python script that will need to be installed in Cura. I've found Cura 15 to be easiest in this regard. Python scripts were a royal hassle to install in Cura 2 (I gave up, since Cura 15 worked well enough for this purpose). I haven't yet tried to install any in Cura 3. If a script is used, before printing you will need to set the script parameters to match the associated tower design. Cura's help will walk you through it. If there's no Python script, then the .scad file will contain everything needed. Before printing, be sure to set the initial temperature and speed! Be sure to print the Temperature Tower at a relatively slow speed (I use 10 mm/sec), so the hot-end has enough time to reach the next temperature value before printing too many layers. Alternatively, you can use "Pause at Z" or "Tweak at Z" (or any similar script), or modify the .scad file, to insert a suitable delay.